3 RPG Crowdfundings You Should Back – How Orcus Stole Christmas!, Mythic Mania 2, and Tegel Manor Returns! Mock-up of the softcover Swords & Wizardry release. Ends on Tuesday, December 18 2018 12:59 AM EST. “Legendary Games makes massive mythic rules upgrade with the amazing Mythic Character Codex & Mythic Monster Manual 2 for Pathfinder! Since then we’ve continued creating even more magnificent mythic material, bringing you even more paths, monsters, magic, and more from around the world, and the time has come at last to close the circle and bring it all home to you. Welcome to MYTHIC MANIA II !!! Mythic Mania II encompasses two books rather than three, and incorporates mythic material for hardbacks like the Advanced Class Guide, Forest Kingdom Campaign Compendium, Horror Adventures, Occult Adventures, Ultimate Intrigue, and Ultimate Wilderness, as well as potentially adding in more material from the Adventurer’s Guide, Monster Codex, Planar Adventures, Villain Codex, Book of the Damned, Pirate Campaign Compendium, and more! The question, and it’s been asked here* and elsewhere, how much draw does Pathfinder 1e still have versus the draw of Pathfinder 2e? 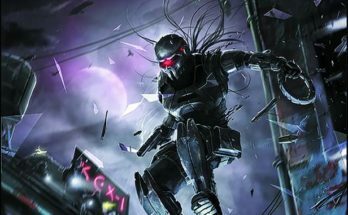 Based on the funds pledged to Legendary Games‘ Kickstarter so far (with over 3 weeks to go as of this writing), there is still a great deal of love for Pathfinder 1e. Obviously, a lot of this Kickstarter’s draw is Legendary Games as they’ve done a number of well-received Pathfinder products – there’s a good sampling on the Open Gaming Store: 40 Books, 30 Bucks Pathfinder MEGA-BUNDLE. But the desire to continue to expand the PF1e ruleset cannot be overlooked. Mythic Mania 2: Two New Mythic Rulebooks for Pathfinder RPG is the sequel to a project created by Legendary Games, Kobold Press, Rogue Genius Games, and Dreamscarred Press. Those original books – Mythic Hero’s Handbook, Mythic Monster Manual, and Mythic Spell Compendium – amped up the possibilities of Pathfinder. With these two new books, Legendary is bringing you Mythic Character Codex and Mythic Monster Manual II that will add even more options to your Pathfinder games. In a mark of the love for PF1e, this campaign offers to let you select an aspect of Pathfinder that you love and elevate it by sponsoring its inclusion in these books. Several of the sponsorship levels link the d20pfsrd.com site (part of the Open Gaming family of websites and the reason I wanted to highlight this option) as references to pull work from. If you are a fan of a particular aspect of Pathfinder, this is a way to share that love with the world. $75 – Archetype Architect: Choose any published Pathfinder Roleplaying Game archetype from d20pfsrd.com (barring those that are legally restricted) for inclusion in the Mythic Character Codex. Your name will be listed as an Archmythic! $200 – Spawn a Monster: Choose any published Pathfinder Roleplaying Game monster from d20pfsrd.com (barring those that are legally restricted) for inclusion in the Mythic Monster Manual II, including a beautiful illustration. Your name will be listed as the Spawner of that monster! $300 – Classy Creator: Choose any published Pathfinder Roleplaying Game character class from d20pfsrd.com (barring those that are legally restricted) to have its class features made mythic in the Mythic Character Codex, including a beautiful illustration. Your name will be listed as a Classy Creator! Should you back this Kickstarter? Are you playing Pathfinder 1e? If so, and you’re hunting for more crunch, these are the books for you. This crowdfunding campaign ends on Tuesday, December 18 2018 12:59 AM EST. You can support this Kickstarter campaign here. *Whether you filled out the survey here or not, you can enter discount code “PF2SURVEYED” when checking out at the Open Gaming Store and get an extra 10% off your order there. [Note: This is a limited time offer subject to end at any time.] The Open Gaming Network is sponsored by the Open Gaming Store, and your purchases help fund this content. Ends on Saturday December 1, 2018. “A joy-filled holiday adventure for either Fifth Edition, Swords & Wizardry, or Pathfinder campaigns. Can your party save the children from the mysterious visitor’s clutches by Christmas? 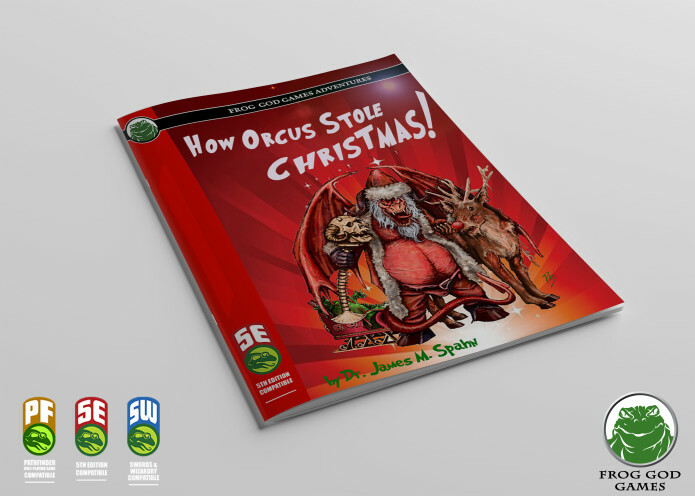 Frog God Games wants your support for our first holiday adventure in over a decade -“How Orcus Stole Christmas!”. Written by James M. Spahn, this, our third Indiegogo project, will warm your heart this winter. A detailed description of our process and goals fulfillment process can be found in the FAQ. O, Come All Ye Faithful…. to Newville! All the News down in Newville were nestled snug in their bed. But come Christmas Day they might end up dead. 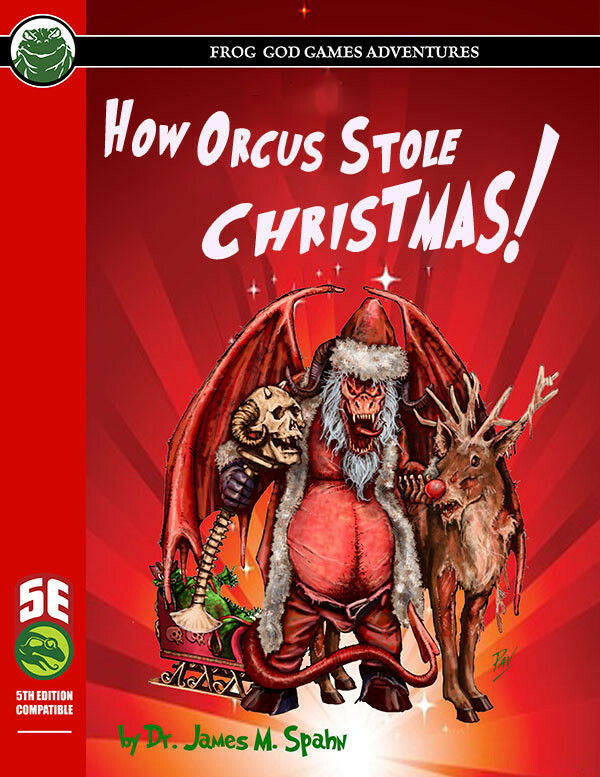 How Orcus Stole Christmas! can be used for any holiday-themed adventure in a session that includes low-level characters (though admittedly it is pretty easy to scale up). A description of the village of Newville, the demeanor of the News, plus exciting rumors about the surrounding valley. The valley is thought to be full of adventure. The author’s manuscript was bursting with bloody sarcasm and holiday humor. 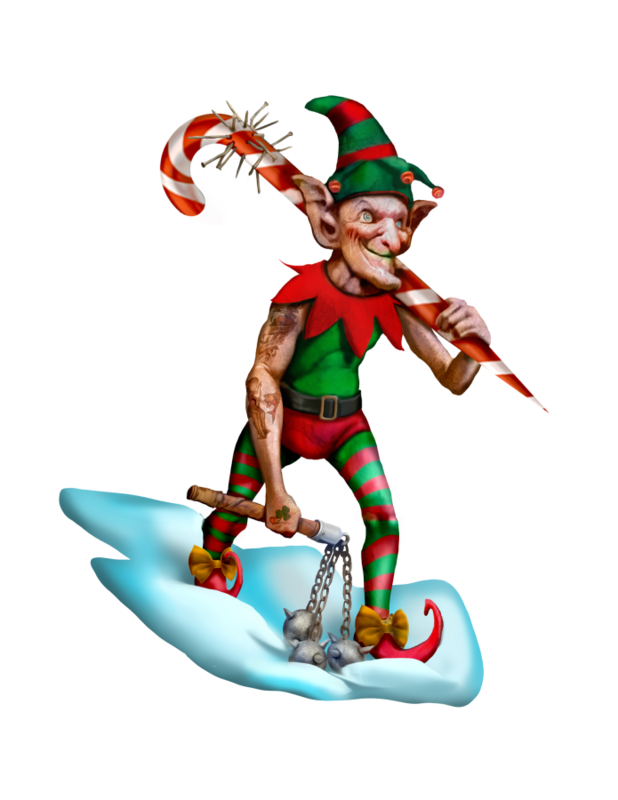 Yes, that is one of the merry Crueltide Elves on his way for another day at the plant. Notice the motivational pointy shoes…a sure sign of management. What is missing from this holiday extravaganza? A miserly old Englishman and his ghosts. This crowdfunding campaign ends on Saturday December 1, 2018. 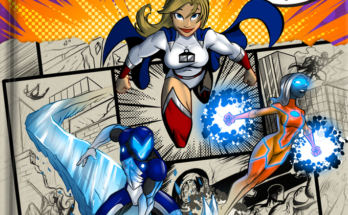 You can support this IndieGoGo campaign here. Ends on Sunday, December 23 2018 11:59 AM EST. “The Haunted House that started it all! Ever wonder how Frog God Games got its name? Of course, we have to credit Clark Ashton Smith… but our roleplaying roots lie in Tegel Manor. Tegel Manor was mind-blowing in 1977 and it remains cool today. This intertwined and sinister relationship between the house and its chosen family is a history of horror, evil, and greed. There is a lot for the characters to learn about the curse, and their knowledge might just keep them alive long enough to tell the tale. That scar is the smallest one in the Rump family! If you’ve already seen the 1977 version of the Manor, there’s a lot more for you to learn in this updated and expanded 5E version of the classic. This printing contains expanded descriptions of the rooms, new areas, new monsters, new magic items, and much more, all with spectacular color illustrations. A reproduction of original 1977 map. Keep in mind, for their How Orcus Stole Christmas! 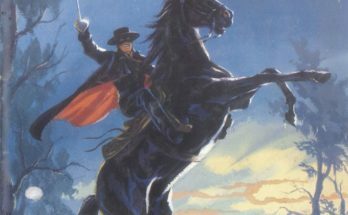 A Holiday RPG Adventure, they are offering a Pathfinder 1e version but only for a “tiny print run.” It’s logical that FGG’s concern is less about the strength of PF1e than about having unsold print copies of their version of Tegel Manor, which is likely to be a book in the high hundreds of pages when PF2e rolls out. It would be too expensive to risk having to liquidate it should PF2e become the hit Paizo believes it will. Regardless of that, this project still offers the dungeon for 5e and S&W, so there are good options to choose from. This crowdfunding campaign ends on Sunday, December 23 2018 11:59 AM EST. You can support this Kickstarter campaign here. 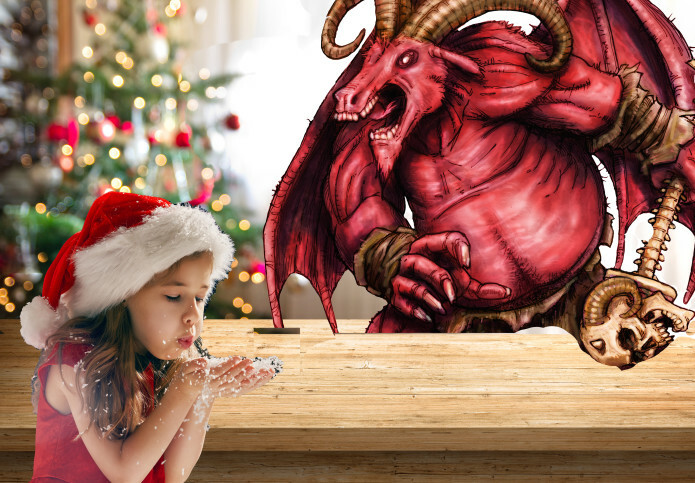 TaggedEgg EmbryFrog God gamesHow Orcus Stole Christmas!KickstarterLegendary GamesMythic Mania 2: Two New Mythic Rulebooks for Pathfinder RPGRPG Kickstarters You Should BackTegel Manor Returns!